Summer display at the stone summerhouse, with petunias edged with spider plants in the ground; four pots of Amaranthus caudatus, known popularly as love-lies-bleeding; and a plum coloured ornamental banana, Musa ensete maurelii as the centrepiece. This year’s scorching summer continues. Lawns are looking parched, and borders flag…as do the gardeners too. 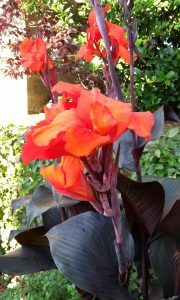 All is not lost with regard to sustaining lush and colourful garden displays however. With a little love and attention, pots, urns, and hanging baskets can be relied upon to continue their display of brilliant colour right through the summer until the first autumnal frosts strike them down. 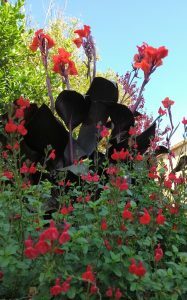 Most plants used in summer seasonal displays originate from sub-tropical regions, and as a result they will continue to flower through the whole summer, unlike permanent displays of hardy herbaceous perennials, shrubs, and bulbs in our borders that have a shorter period of interest when they are in full flower. The three points to remember are water, feed, dead-head. Given that seasonal displays are actively growing and flowering right up until the first frosts, and growing with their roots in restricted containers, they are very thirsty for water and hungry for food. With this in mind, it’s essential that regular watering is maintained throughout the season to ensure that the growing medium in which they are planted doesn’t dry out. Here at Deene Park we water on alternate days, and thoroughly drench when we do, ensuring that the growing medium is thoroughly wetted. Where feeding is concerned, we use a general all-purpose plant food available from any good garden centre, that is mixed with water and applied fortnightly. Finally, it’s essential to keep up with dead-heading. Removing faded flowers and any seed-pods that may form is essential for prolonging the flowering season to the very full extent. Flowering plants simply want to reproduce. If flowers fade and seed pods form and ripen then where the plant is concerned, the need to spend energy of flower production is gone. Removing the means by which the plant feels that it has succeeded in reproducing, you are encouraging it to keep on trying and keep on flowering.